Who am I: I was mommy's little boy. One of the things I enjoyed doing was cooking lentil stew. I had a twin brother. Your MARRIAGE Can Be Happy! WHY are most marriages unhappy? Here, continued from the lost issue, are the BASIC CAUSES for emotional instability in the home! In the last issue, many of the modern-day emotional problems were illustrated. Most people today are unhappy! The high-pitched standard of American living has swept society through a flood-gate of emotional turbulence that has dashed countless marriages against the rocks of despair and misery! The constant, dizzying hum of sensuous living is provided the average thrill-seeker through the movies, the TV sets, the novels and magazine articles that flood our newsstands. 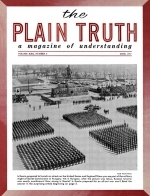 For many years, the pages of The Plain Truth magazine have been bringing you God's thunderous warnings of impending national disaster for the United States and the democracies of northwestern Europe. One of the basic reasons for God's righteous ire against our nations is our upside-down home life! The entire WAY OF LIVING of any nation revolves around its family life - its homes. Our whole way of life has been perverted!